The modernized plane AN-3, has been added to the aircraft depot of Tuvan Airlines. The 'new' plane was driven from Omsk to Tuva by a crew led by Alexey Chuduk. The airpark of Tuvan planes comprise of twelve planes-- AN-2 and AN-3, which are involved in airflights within the Republic. The traditional acting contest of "Not-Played Roles" was held at the Tuvan Drama Theatre. 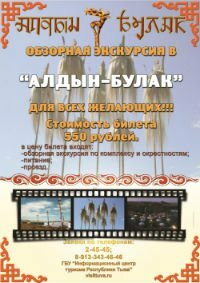 The event was organized by the Union of Theatre Workers of Tuva. For actors of the Republic it is a magnificent opportunity to try a new role which they have been dreaming of playing but due to circumstances were unable to play. Mongush Mannai-ool, a famous Tuvan historian, turned seventy today. He is not only known for his scientific publications and books on the history of Tuva, but as an archaeologist as well. The rescue team of the Tuvan Ministry of Emergency Measures had to rescue a thirteen year-old schoolboy from a broken ice flow on the Yenisei. Rescuers Igor Eluskov and Alexey Malyshev caught up with the boy on the western border of the city. Today the results of the First National Competition of Russian Press "We Shall Stop Violence Together!" have been announced. The ceremony was held in the Marble Hall of the House of Journalists of Russia in Moscow. As the organizers confessed, such an interest in the contest was a surprise to them. Alexandr Svintsov has been appointed as the new Vice-President of the Government and Minister of Construction of Tuva, in the stead of Eugeny Oserdtsov, who left the post due to health problems. Alexandr Svitsov is thirty-four years old and is an ex-businessman. Yesterday, at the extraordinary joint session of the two chambers of the Great Khural of the Republic of Tuva, the Chairman of the Government delivered his annual message to the Parliament. According to Sherig-ool Oorzhak, 2002 was a crucial year for Tuva. Today the well-known ethnographer, Doctor of Historical Sciences, and merited Tuvan writer Mongush Borakhovich Mongush turned 78 years old. He was born on a shepherd's campsite in a picturesque place called Khondergei in the Dzun-Khem district to a poor arat family. The Press-Service of the Prime Minister of the Tuvan Government, Sherig-ool Oorzhak, has submitted the tax Declaration. In accordance with the declaration, the Prime Minister received during the last year 455,840 rubles (approx. 15,000 dollars) for his position. Other sources of his income have not been specified.